When teachers adopt standards-based learning, students take ownership of their education and achievement soars. Written specifically for K–12 teachers, this resource details a sequential approach for connecting curriculum, instruction, assessment methods, and feedback through standards-based education. The authors provide practical advice, real-world examples, and answers to frequently asked questions designed to support you through this important transition. "A Teacher's Guide to Standards-Based Learning systematically shows how standards-referencing defines and unifies planning, instruction, and assessment. The book is more than a 'how-to' primer; it explains why as well as telling how, contains helpful charts for teacher use, and provides a wealth of suggestions for involving students in the process of using standards not only as the end point of learning, but as part of the journey." "Transitioning to a standards-based classroom can be challenging. 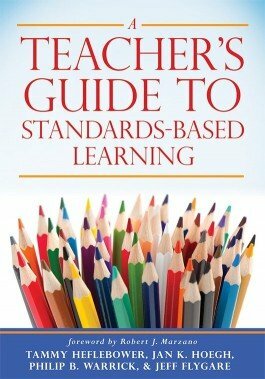 A Teacher's Guide to Standards-Based Learning, situated squarely within Marzano's framework, will serve teachers and instructional leaders well as they transition to instructional, feedback, and assessment strategies that support learners. This book is a practical and sequential companion for teachers and provides clear, working definitions and examples to assist the practitioner in this journey." "Readers will find A Teacher's Guide to Standards-Based Learning an accessible resource for professional development in standards-based learning. The authors have effectively blended best practices with practical guidance that can be realistically implemented in the classroom."